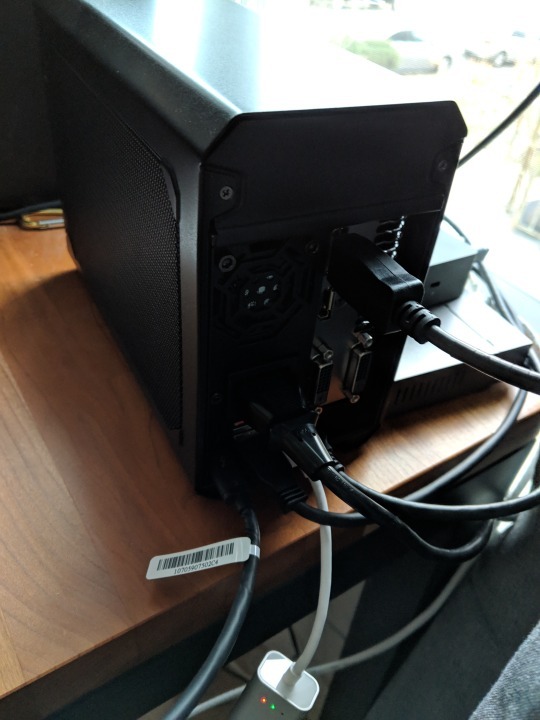 Connected to External 21:9 ratio monitor via Displayport - Audio going over that. USB-A ports used for 2 USB 3 Hubs, and a USB3 to Gig Ethernet connection. So far not terribly laggy or issues. Stock HP Install (just upgraded the install to Windows Pro) Ran Windows update and the HP update tools. Plugged in the Gaming box and installed the Nvidia drivers. It worked. But noticed compared to other pics that the bandwidth was lower than expected, so I fought with updating the gaming box to the H2D firmware... Had to use the RX580 firmware (since the gaming box is just named "Gaming Box" in the TB interface the 1070 firmware wouldnt ID it) after downgrading to the 16.2 TB app and drivers. This was unstable due to the 16.2 seemingly not being happy on this machine. But stable enough to upgrade the firmware then. Upgraded back to the stable 17.4 TB app from there. Ran into a variety of issues so far with unplugging the TB cable and having the laptop report "USB Port Power Surge" endlessly saying a port was demanding more power than it could supply. No event log entries for it... Also if disconnecting a TB cable, and even waiting for it to fully "undock", and putting it into a different TB port on the laptop results in BSODs. The implementation hasn't been as straight forward as I thought it would be, and you can tell there is some shakiness in this setup. I just set it up last night so I have more run time to do on it. And this is a brand new ultrabook that just released 2 days ago to people and one of the first with the Whiskey Lake processor. So I am guessing there is going to be some learning curves here. The gaming box is annoying as hell in terms of noise. Getting a longer cable, and replacing some fans to move it under my desk. The RBG Fusion app has yet to work even once. The quality of the apps and such from Gigabyte/Aorus are really questionable. The price was right, $499 for this setup, and Amazon even offered free payments spread out over a few months. cant argue with that. I want to use this gaming box as a docking station essentially, and so far its doing it. Besides for some weird glitches with the keyboard/mouse on it... I haven't had any issues. Came from a Surface Pro 4 i7, this new setup with the new Spectre and the eGPU have made Lightroom/Photoshop and various games I pay MUCH more workable. @clegg - Here is what works for when my AORUS box decides to fly out of the coop. 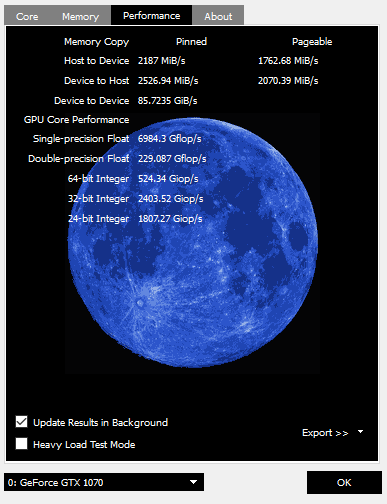 I run it with a Spectre x360 (the previous 13" model, square one, with the i7-8550U). Typically it happens after a sudden disconnect, or a long time when it was connected to power but the system itself was off. 1) Disconnect the AORUS from power and the laptop for a minute or so. 2) Shut down the laptop. 3) Boot the laptop WITHOUT the AORUS connected. 4) Connect the power to the AORUS. 5) Connect the TB3 cable to the laptop. I gave that a go, no love. it knocks everything off the USB ports on the machine when it plugs in. Its very very weird. Best I can figure is the 580 firmware fucked it up badly after a swapping of a connection. New replacement is already ordered through Amazon. The box never really worked 100% for me anyway (and the box wasn't clearly sealed when I got it... left me wondering if someone else played with it first) , so I am hoping a the new replacement will behave better. 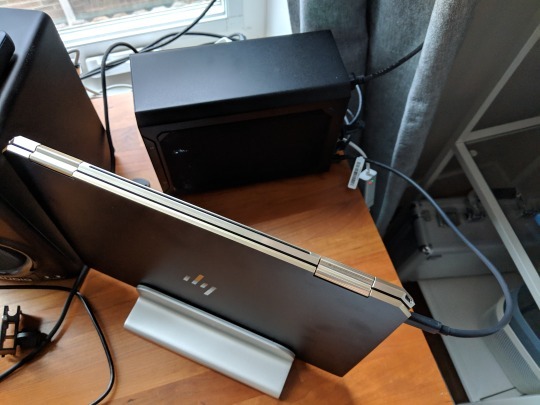 I have a similar setup, just using the older spectre x360 (early 2017, 15" model) & also wanted to use the eGPU as a dock. 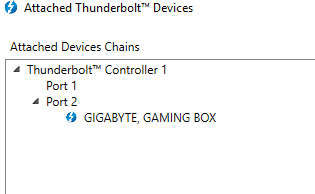 Had similar sort of problems as you, USB's randomly disconnecting (sometimes one, sometimes all), GPU randomly disconnecting, unplugging/replugging not working properly, restarts not bringing either the GPU/monitor or USBs or both back etc. HP finally released a firmware update as part of their OMEN EGPU, which took the NVM version from 9 to 16, which made the eGPU a lot more stable but still had issues as above (just not as frequent). I tried the different Aorus firmwares, didn't really make a difference. Then I got a USB-C monitor (just displayport + downstream USB ports via USB-C, no Thunderbolt). To my surprise, this connection also wasn't stable, and I would still get random USB drop outs (no display crashes though). Finally I got a new Toshiba work laptop with Thunderbolt. When I bring it home, it works flawlessly for hours/days running at a time. When I reboot, plug/unplug/replug it just works, every single time. Go back to the HP and same old issues. I figure it was just the laptop I had (maybe bad wiring, or old firmware, or something) and was planning to upgrade it to the same model as yours (gem cut). However I'm now worried that HP are doing something wrong! 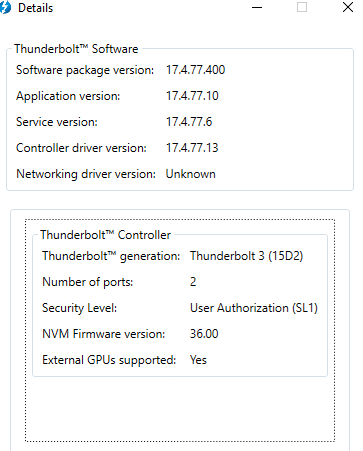 I was quite disappointed at the lack of firmware updates for the laptop as well, considering other manufactuers are still releasing updates to theirs (same model laptops from Dell/Lenovo are getting NVM 33 updates, HP hasn't released one other than the Omen team releasing v16). Please keep us posted with your updates, I'd be keen to see how the replacement goes. I have the same setup as you (Late 2018 Gem Cut Spectre/Gaming Box 1070) and also get the same non-stop USB power surge warnings whenever I unplug the egpu without safely ejecting first. I even get these warnings if I shut the computer down and then disconnect. This combo of computer/egpu is only combo I have seen this happen with. Somebody else on here has this computer with the Razer Core and doesn't appear to have any problems. Clegg - When you get your replacement Gaming Box back, please let me know if you are getting the same USB power surge warnings! I'm also wondering if the fact that both of ours would only take the 580 firmware has anything to do with it? How are things going now? Did you ever get your replacement and if so, how was it? I was thinking of a similar setup although these reports of issues with this combo are starting to concern me.